Welcome to the 428th Metamorphosis Monday! When I read Eric’s description, I could so identify with the issues he was having with the existing deck(s) on his home because similar problems are what prompted me to tear off my old deck and replace it with a screened porch. The back of my home also faced south and the decks were so hot during the day, you couldn’t walk on them while barefoot. Here’s how Eric and Denise’s home looked prior to the renovation. 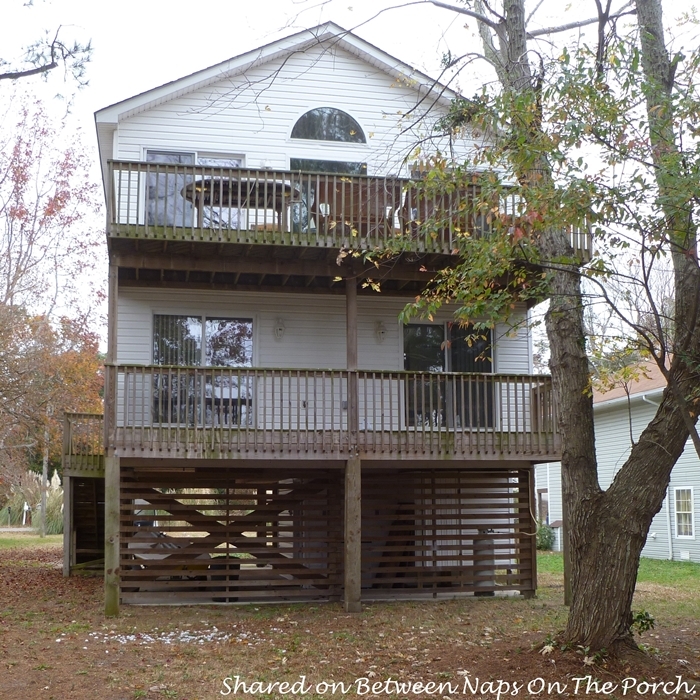 The only thing better than a porch is two porches! 🙂 I absolutely love a double porch! 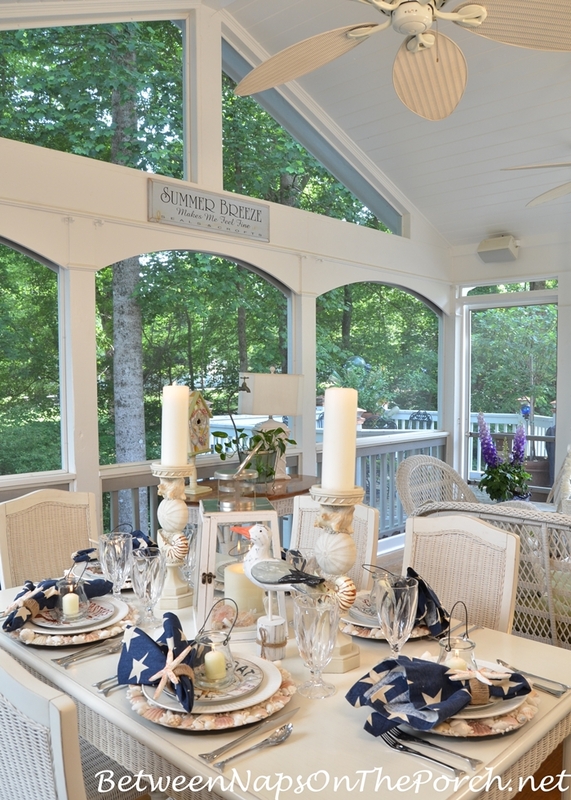 When building a porch, if you have the space and the design will work for you home, go up with the ceiling! A gable roof makes a porch feel so spacious and open and I really do think it helps with airflow on those hot summer day. Porch breezes are the best! Eric said, “We used many of the same features you had on your porch. I struggled to find a builder who would build the open gable, so I came up with a design, then had an engineer draw the plans. I asked Eric for more information about the concern his builder had regarding the open gable. I remember when my porch was being built, my contractor filed a building permit and one of the requirements our county inspector insisted on during one of his visits was something called “hurricane clips.” We rarely get hurricanes here in the Atlanta area, but we do get some very strong winds from time to time. 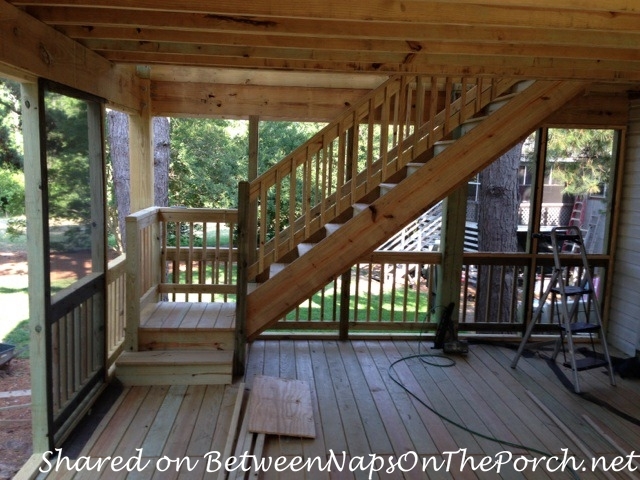 A view of the staircase that leads from the lower porch to the upstairs porch. Wow! Such a gorgeous view! 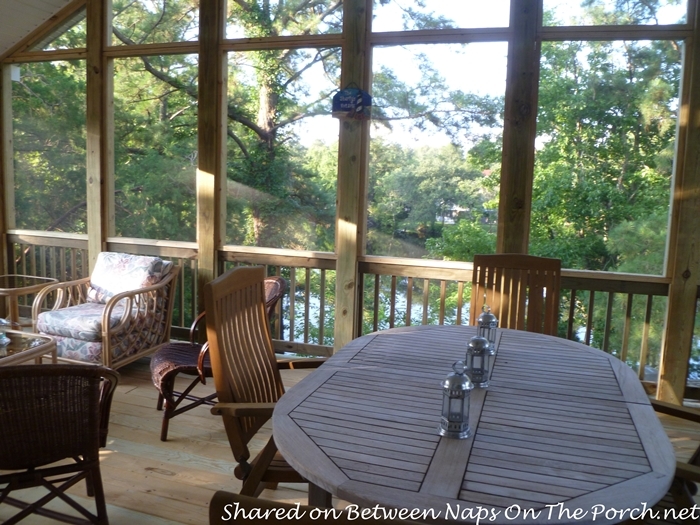 From the porches, Eric and Denise have a wonderful view of the lake behind their home. 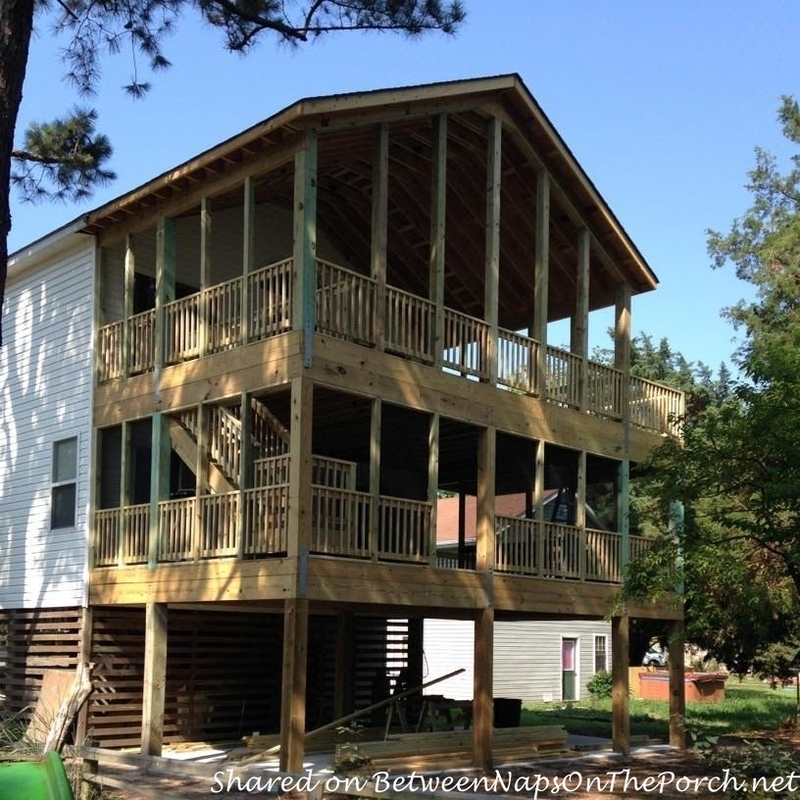 Ready to see the finished porch? That’s a great shopping tip! 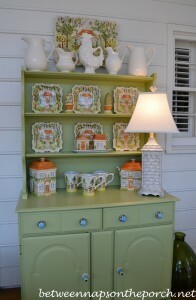 When adding on a porch, shop yard sales, estate sales, Craig’s list and other second-hand stores. It’s amazing the great pieces you can find where folks have moved and may not have a porch or sunroom in their new home. You can really find some pieces that way. There’s that amazing view again! Love! Thanks so much to Eric and Denise for sharing this amazing transformation! 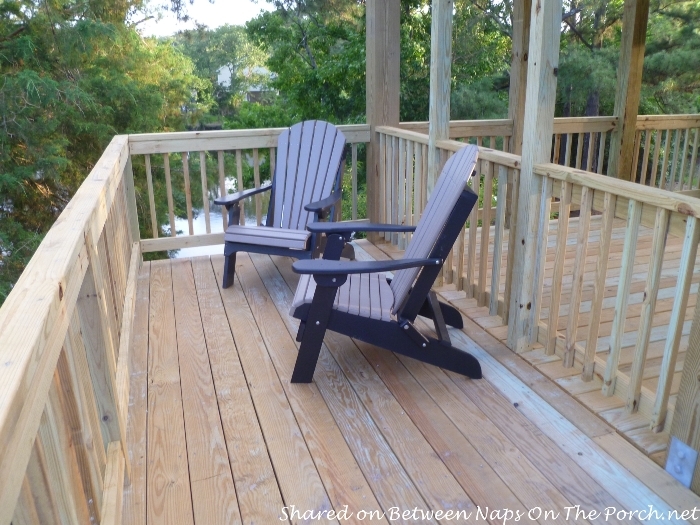 Porch season is here and I know those lake breezes are going to feel amazing this summer! Such a wonderful spot for entertaining friends and family or just relaxing on those lazy summer days! Ever wonder how much it costs to add on a porch? 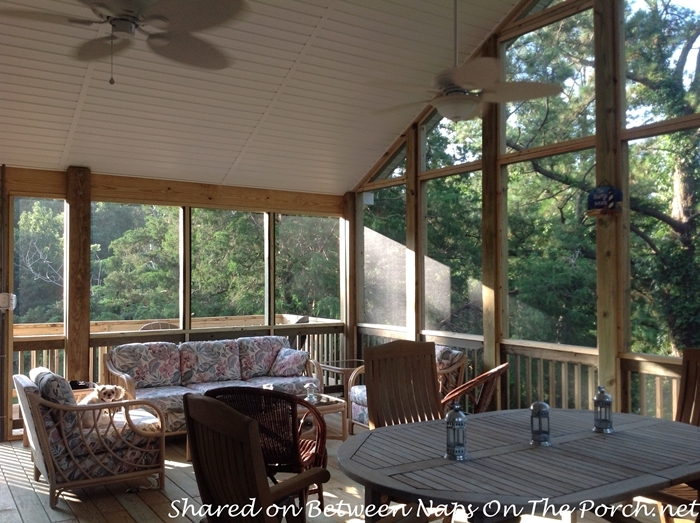 I break down all the details and share the cost of adding on my screened-in porch in this previous post: Screened-in Porches: How Much Do They Cost to Build? Thinking of adding a porch or double porches to your home? 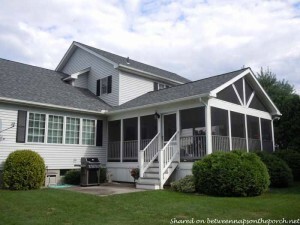 You’ll find another fabulous double porch design here: Beautiful Porch and Deck Addition. What a great renovation Eric & Denise did. Wow, that’s like major real estate added on! Second home could easily become first home, given so much space for entertaining. We have finally crossed off the kitchen project (with a slight caveat), and this week should be a big week for the bath – fingers crossed! Never mind what week we’re into to, what month is this anyway?? Thanks for hosting us, and always inspiring us to better our homes, Susan. Fabulous porches!!! Thank heavens for porches. the porch to retreat to. 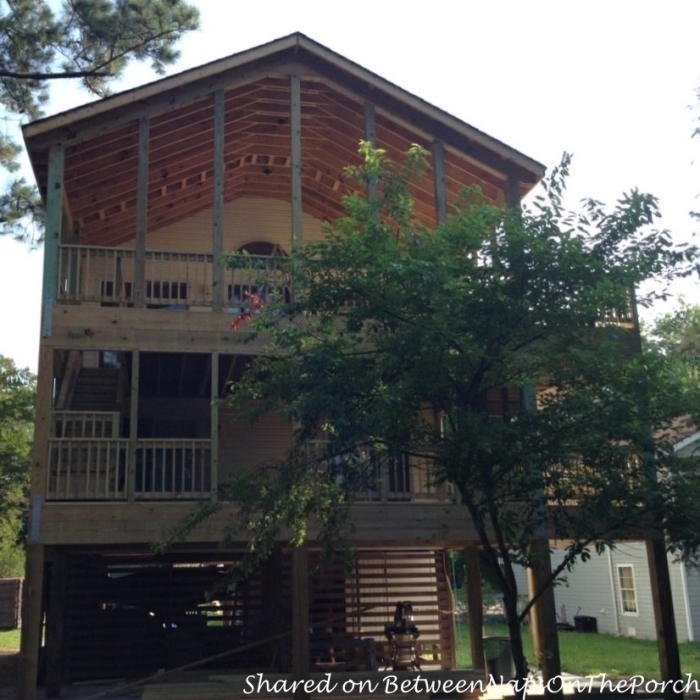 Love these porches,including yours….the only thing better than a porch is two porches! Wonderful renovation. Love that Denise added the side decks. Hope they enjoy the porches for many years. What a major transformation. Fortunately, our patio has 3 sides so only one side needs the screening. We love your porch and that has been our inspiration for plans for screening ours which is on the list for this year! Yeah! Look forward to no more mosquito attacks! What an amazing space! Bring on the warm weather! You must be so thrilled to be an inspiration for this porch redo Susan! It looks fabulous and yes the gable makes all the difference! We lost our beach house roof during hurricane Ivan, and went we rebuilt, we vaulted the great room ceiling, it’s like our house is twice as big now! Have a great week and Happy Easter! Right, two are better than one. One off my bedroom, one off the kitchen. Once the pollen settles they’ll bloom again. Checked out your Moroccan pictures. The Souk and the desert makes me want to go back. But I won’t. Next trip India, and I’m iffy on that. Travel is now so stressful and reading your comment about DeGaul infuriated me. Just booked a cruise for New England later this summer. Lobster all the way. No passport needed. Nice to have you back. What an amazing transformation of that house! 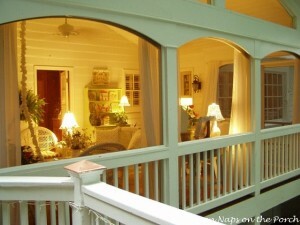 Love the double porches! Isn’t it great that they could capture and use some of your porch ideas! They will enjoy this for many, many years. Thanks for sharing. What a wonderful way to enjoy beautiful views. We are renovating a VERY small lake house now. Wish I could add double porches, but I’ll be doing well to get one screened porch. Thank you for sharing this inspiration. I enjoyed that very much! I love high ceilings and also think the open gable makes a world of difference. I can just imagine the wonderful summer parties they will be having this year and the years to come! There is plenty of room for red, white and blue bunting! It is just a beautiful porch. I want to move into that house. The porches are absolutely beautiful. And of course your entire house is georgous. Living in a ranch in Texas I could not have those porches, but now I need to at least spruce up my patio. I am jealous. Oh wow, the final result is gorgeous! It looks like it is screened in which is wonderful. I can just imagine relaxing out there! Wonderful that they got inspiration from yours! 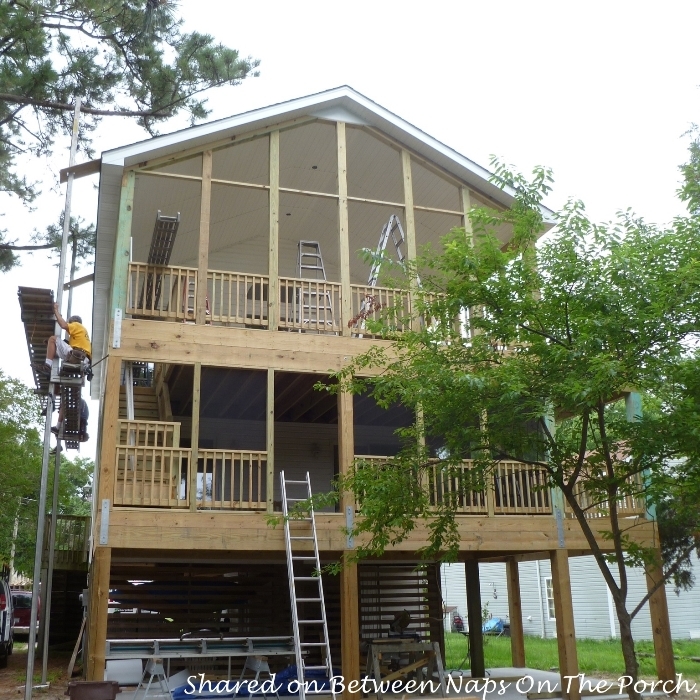 What a lovely transformation, and so much living space gained with two porches! I love the lake view–so relaxing. What a beautiful setting for a vacation home! The porches are beautiful and I love that they have the open side porches. Hi Pam, Which light fixture are you looking for? Like the one on your screened porch–next to a door. We are in Ga, within an hour of the coast. The doublewide we bought last year (bank foreclosure, super price) came with a front porch. It has an open gable. B/c the living room window is wide, and faces east, that open gable lets in the BEST light! I will never close it in. If we build a second, back porch, it will also have that open gable, to let the western light continue in. 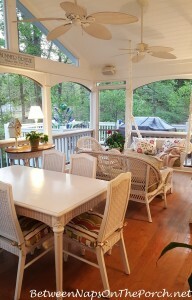 Now that we’ve started repainting and furnishing our porch, we love it so much! What did you think about the travel pillow you purchased for your trip? I LOVED it! It worked great, it’s definitely my favorite now. When I awoke, the guy sitting next to me wanted to know where I bought it! 🙂 I watched a video on YouTube explaining the different ways to use it and the way that I found that worked best and was super easy was to loop my hands through it in front, as shown in the video. I’ll do a post and link out to that video because I definitely love that pillow. It will go with me on all future trips. We had a porch at my Grandmother’s house, where I grew up and I have always wanted one of my own but it is not to be. Today though we did get the awning cover off and can now put the awning out on the deck. We also added party lights! I am so excited to be able to sit out there again. The porches in this post are just beautiful. Thanks for sharing them. Oh my gosh, how AWESOME. And no, Susan, I still haven’t built a porch. I think about it every single day. So pathetic. I am currently relaxing on this heavenly porch. It really is unbelievable. Denise and Eric (my sis and bro-in-law) are very generous and let us stay here whenever we can get here. You sit out here and don’t want to leave. My boys are on the lower decks laughing together. My Mom is taking a nap and my husband is surfing the web next to my Golden Retriever. All against aback drop that looks like a painting. Wish I could post a picture!! 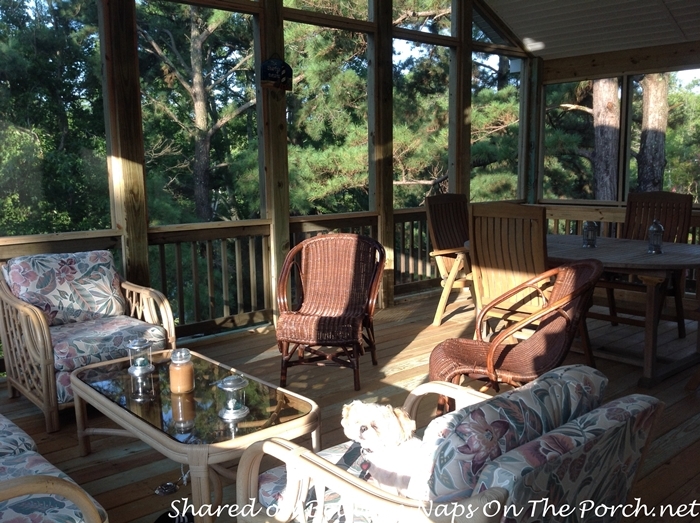 Thanks for featuring this massive porch on your blog! !